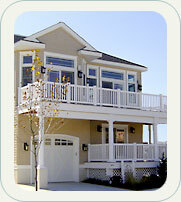 Owning a home at the shore, a family retreat to create memories of a lifetime, is the dream of many families. Drumar Construction's mission is to answer that dream. And your dream deserves special attention! Drumar Construction, founded by Joseph and Krista Templin, has created a team of professionals who allow you to sit back, relax and let them do all the work. The Drumar team sets the standard for new home construction, offering today's buyer the highest quality home in the most attractive locations, satisfying all your shore lifestyle needs. Thanks to the talents of our in-house architects, each Drumar home has its own personae, one that will not be duplicated repeatedly throughout multiple homes. This creative flair is further complimented by our interior design team. Each fixture, piece of stone, tile and wood, cabinetry and custom paint palette is carefully selected to enhance the personality of your home. Drumar Construction is proud to offer you a wide variety of unique homes for your consideration and enjoyment.